X-shaped in plan, the new Museum of Liverpool will on completion be a striking addition to the fast changing Mersey riverfront. Designed by Danish architects 3XN, the structure is located at Pierhead and will replace the existing Museum of Liverpool Life which is considered to be too small to house an ever-increasing collection. 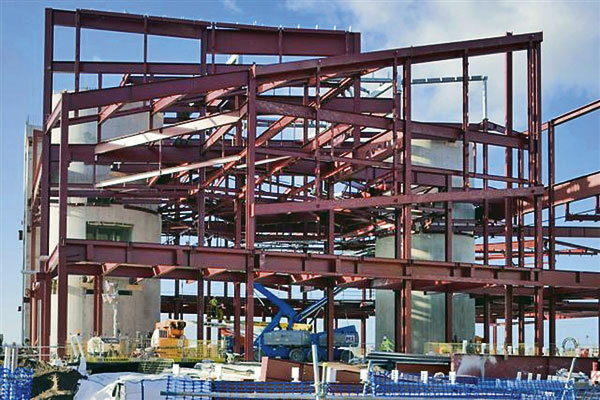 Working on behalf of main contractor Galliford Try, Caunton Engineering is fabricating, supplying and erecting more than 2,000t of structural steelwork for the project. Caunton’s Contracts Manager Gary Hatton, said: “We are currently completing phase one of three phases which includes connecting steelwork to circular and square concrete cores. The final two phases will see Caunton erecting the four fingers of the X-shape and this will involve temporary propping for two large cantilevers, one of which will house a viewing gallery overlooking the Mersey.